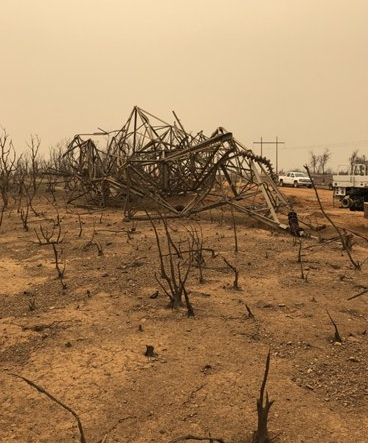 Aftermath of the Carr Fire "fire whirl." With wildfires continuing to scorch the West, the resulting smoke is continuing to have an impact on air quality in Humboldt County that ranges from good to unhealthy depending on the area. The deadly Carr Fire to the east has burned nearly 215,000 acres and killed at least eight people, including a Redding firefighter who a recent report says died after becoming engulfed in a tornado of fire, according to multiple media reports. 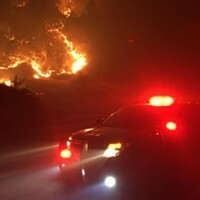 A San Francisco Chronicle story detailing Calfire’s report on Jeremiah “Jeremy” Stoke’s death states the 37 year old was overcome by a massive fire whirl with winds up to 165 miles and a base the size of three-football fields. The column of fire created by a destructive combination of “intense rising heat and turbulent winds” was equivalent to an F3 tornado and left a path of devastation, according to the National Weather Service. There is no estimated containment date for the blaze. 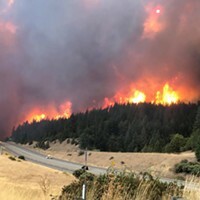 To the south, the Mendocino Complex continues to cement its place as the largest fire in California’s history at nearly 370,000 acres. One person has been killed. Full containment is still estimated to take place by Sept. 1. Find the latest fire information, including road closures and evacuations, here. 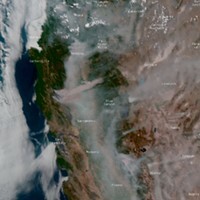 Wildfires remain active throughout Northern California and Oregon. The fires with the potential to impact our area (depending on conditions) continue to be the Klondike/Taylor and Natchez Fire (Del Norte & Southern Oregon), Carr and Hirz Fire (Shasta/Eastern Trinity County), and the Mendocino Complex (Lake/Mendocino County). Inland Humboldt and Del Norte County will continue to see smoke impacts in the drainages. The return of high pressure and hot temperatures will increase fire activity and decrease smoke dispersion in drainages close to the fires. Smoke from the Mendocino Complex is expected to come northward into the inland drainages of Humboldt and Trinity County. Smoke originating from wildfires in Canada also continues to slowly move down along the coast. • Orleans can expect “Moderate” to “Unhealthy for Sensitive Groups”, with periods of “Unhealthy”. • Hoopa and Willow Creek should see some improvement of “Good” to “Moderate”, with periods of “Unhealthy for Sensitive Groups” through Friday. • Air quality along the coast is expected to be “Good” to “Moderate” through Friday. The forecast for Northeast winds this weekend may result in occasional periods of “Unhealthy for Sensitive Groups” along the coast. • The monitor in Garberville continues to indicate “Good” to “Moderate” conditions as the smoke seems to be staying more to the East. Continued burn out activity on the Carr and Hirz fires will increase smoke production. Weak inversions in the valleys and drainages will keep smoke levels elevated. Light southerly winds through Friday and the arrival of northerly winds over the weekend will bring limited relief. An Air Quality Advisory for “Unhealthy” conditions has been issued today (8/16) for Weaverville, Lewiston, and Trinity Center.